The Backyard is already set up for Winter, but I figured I'd post this "tutorial" even though it was meant for last month. September was a very busy month for me and BB, but better late than never, right? The weather's still warm enough to feed syrup, so here goes. The cinnamon is NOT keeping the ants out of the syrup. The slot in the feeder should be parallel to the combs below. This is an Ashforth-type feeder (has a beespace beneath) so it's not super critical, but the parallel orientation gives the bees the easiest access and enables them to take the syrup quickly. To ensure the bees will be able to drain it completely, pour only enough syrup to make a shallow pool in the feeder. 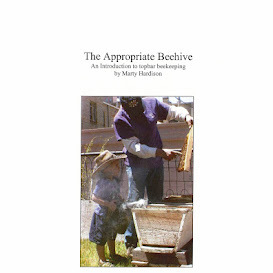 Rotate the feeder or tilt the hive to make sure the pool is on the bee side. For your first feeding, only give them a small amount of syrup, in case there's trouble. If you need to clean out ants, you don't want to have to try to siphon off a gallon of syrup. A kitchen towel can easily absorb a cup or two, so start small and see how it goes. Speaking of trouble, a cache of syrup can set off robbing so I only fill the feeder in the evening, when everyone is at home in their own hive. I'm feeding because this colony is small, and it would lose in a fight over syrup. Weatherstripping DOES keep the ants out. This syrup is a little thin – you can tell by all those ripples – and in very warm weather will ferment. If you smell a sour aroma near the hive, it's likely white fuzzy mold is growing in the syrup. So again, don't put in more than you want to have to clean out. My syrup recipe is honey + water, about 3:1. If you're feeding sugar syrup rather than diluted honey, you're supposed to use a ratio of 2:1. Once you get a feel for the right mix, fill the feeder slowly to give the bees in the slot a chance to back up. Otherwise someone will get covered in syrup and drown. This type of feeder typically holds about a gallon. The screen is a convenient place to put a mini pollen pattie. LESSON LEARNED: We ended up removing the piece of weatherstripping at the top edge of the above picture, as it was encouraging mold in the roof. The ants can't get past the bees from that side. The roof was scraped as mold-free as possible, wiped with white vinegar and replaced. No further mold has appeared.